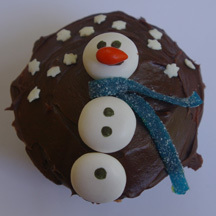 A mint hat adds the finishing touch to this snowman cupcake. What You Need: 1 cupcake; white frosting; 1 thin mint (such as by Necco); 1 Junior Mint; 2 black M&Ms; candy orange slice; 5 mini chocolate chips. How to Make It: Frost cupcake. Use dab of icing to stick Junior Mint to center of thin mint for hat and place at top of cupcake. Add M&M eyes. Cut piece off candy orange and add for nose. Place 5 mini chocolate in a smile shape. Don’t take this cupcake design literally; it’s just one example of how you can use the 1M swirl technique and plastic picks to create cute cupcake figures. You can buy plastic picks for all occasions! 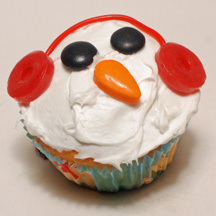 What You Need: 1 cupcake; white frosting; pastry bag and IM metal tip; snowman pick; 3 red mini M&Ms. How to Make It: Follow technique linked above to make IM swirl in white. Stick pick in top. Add M&M buttons. That’s it! 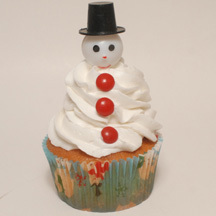 You don’t have to get all three-dimensional to make a snowman cupcake. This easy snowman’s fruit roll scarf creates the appearance of a head and round body! 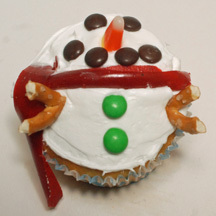 What You Need: 1 cupcake; white frosting; 2 green M&Ms; 6 brown M&Ms; red fruit roll; 2 mini pretzel twists; candy corn. How to Make It: Frost cupcake. Using a knife or scissors, cut a strip of fruit roll and roll into a scarf. 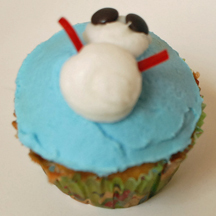 Place scarf about two-thirds of the way from the bottom of the cupcake so it separates the head from the body. Fold one end of the “scarf” over a bit. Add brown M&M mouth and eyes. Add candy corn nose. Add 2 green M&M buttons. Break pretzels in to shapes to look like stick hands and place on either side of snowman. This snowman is chilly, but thankfully he brought his earmuffs (in the form of cherry LifeSavers.) These cupcakes are easy to make, especially for kids, because all you do is place the candy on the cupcake! How to Make It: Frost cupcake. Add M&M eyes and candy nose. Place LifeSavers at sides of face for earmuffs and connect with strand of red licorice. You can add a mouth if you’d like, but I thought my Frosty looked cute without. 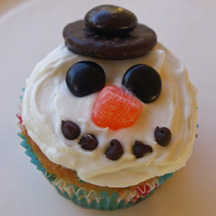 There are as many ways to make a snowman cupcake as there are to make a “real” snowman! This version comes to life someday thanks to two piped icing blobs, mini M&M eyes and red licorice arms. What You Need: 1 cupcake (baked and cooled); white icing tinted light blue; white icing; pastry bag and #5 tip (or just use packaged tube of icing or a plastic bag with a hole cut in it); 2 brown mini M&Ms; red licorice strings. How to Make It: Frost cupcake blue. Fill pastry bag or plastic sandwich bag partway with white frosting. (If you’re using a plastic bag, cut a small hole from which to squeeze the icing. If you’re using a pastry bag, use metal tip #5 or similar.) Squeeze icing into one spot until you have a quarter-sized blob. Stop squeezing before you pull away so the blog stays flat (You can flatten it yourself if you need to, but do it before the icing hardens,) Pipe a similar but smaller blob above the first. Place 2 mini M&Ms, upside down, on the top circle for eyes. Cut strands of red licorice for arms. You could also add buttons, a fruit leather nose or whatever you’d like! 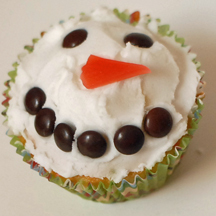 Super-quick to make, these snowman face cupcakes are great for Christmas or any winter event. All you need to decorate them is mini M&Ms and a bit of orange fruit roll. What You Need: 1 cupcake (baked and cooled); white frosting; brown mini M&Ms; bit of orange fruit roll. How To Make It: Frost cupcake white. Arrange M&Ms into eyes and a smile (or frown, or laugh, or however your snowman is feeling). Cut bit of fruit roll into triangle shape for nose.